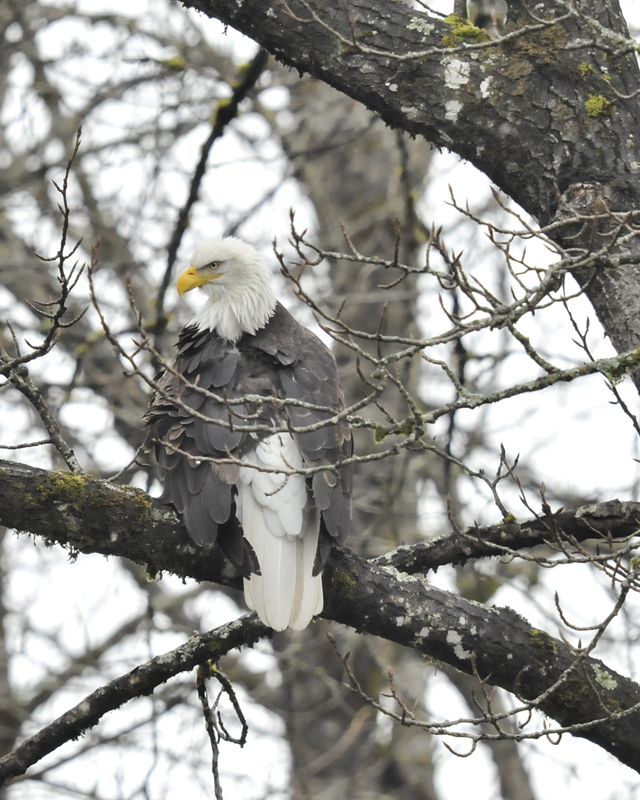 I braved the crud weather up on the Skagit last weekend and saw about as many eagles as people. The eagle watching was still pretty good. I found them perching, feeding, soaring and flying. It seemed like there were more subadults than I usually see, which makes sense because they are thought to stay in the area longer than the adults. 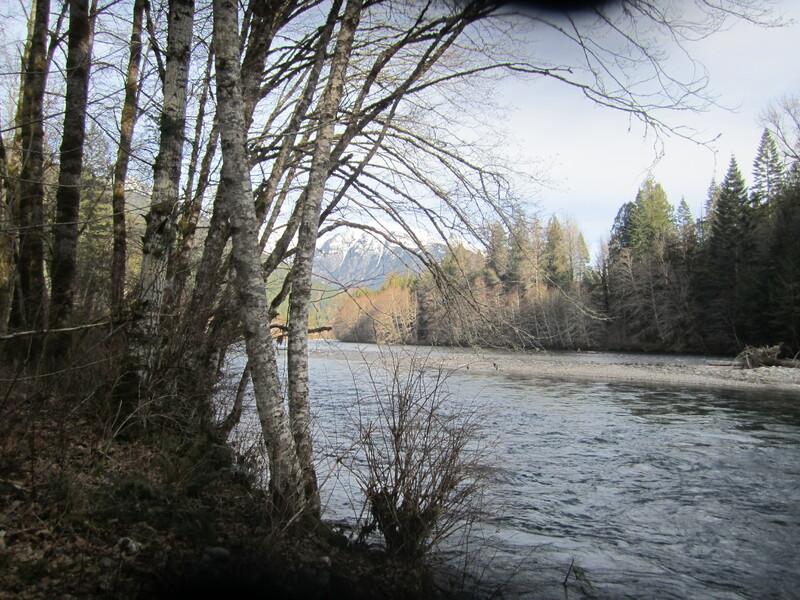 The hot spot on Sunday was just downstream from the confluence of the Baker River. 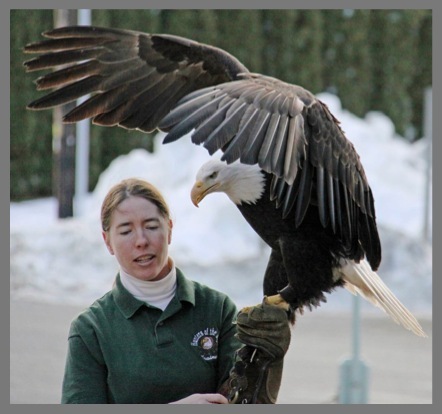 There is one more weekend of the Eagle Festival! Saturday January 28th is the big day with a visit from Sardis Raptor Center with their “Hunters of the Sky” program. Have you ever seen an golden eagle or a falcon REALLY close? Admission is $10. All proceeds go toward care of injured or resident birds at the center. The shows are at 11:00 and 1:00 at Howard Miller Steelhead Park Clubhouse in Rockport. 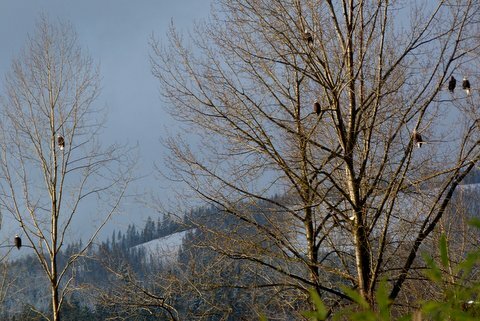 So I supposed that means that you are guaranteed to see an eagle on the Skagit one way or another this coming weekend! I have decided to cancel the eagle watchers volunteer shifts for this weekend as a precaution. The heavy rain and rapid warming could cause travel difficulties, and I want to play it safe and wait for things to calm down, weatherwise. I think I will be ready for some sun by next weekend, how about you? 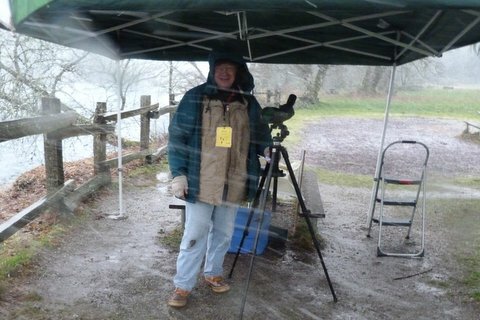 Eaglewatchers viewing stations are tentatively open tomorrow. It looks like snow is a certainty. Be prepared for winter driving conditions! We’ll be up there with shelters and scopes. The opportunity for hot drinks is available at many points along the eagle festival route. Dress warm, drive slow, enjoy and be safe out there. Snow showers likely. Some thunder is also possible. Cloudy, with a low around 24. Southwest wind between 6 and 8 mph. Chance of precipitation is 70%. Total nighttime snow accumulation of 3 to 5 inches possible. Snow showers likely. Some thunder is also possible. Mostly cloudy, with a high near 31. Light and variable wind. Chance of precipitation is 70%. New snow accumulation of 1 to 3 inches possible. 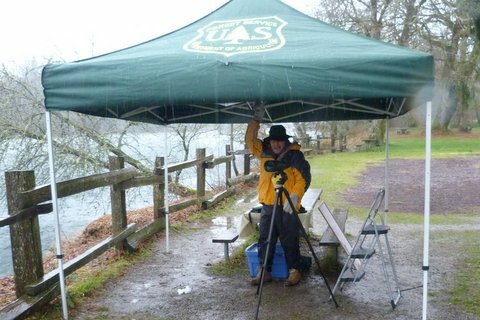 If you are heading out to look for eagles over the weekend, dress warm and bring your raingear. 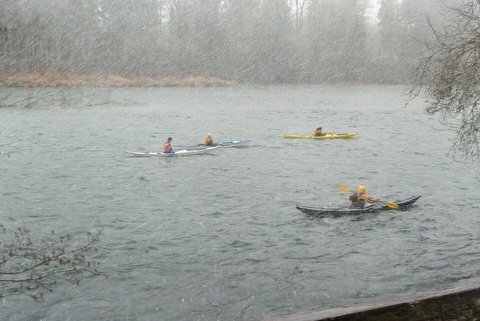 Luckily, there are plenty of indoor activities as well which offer a chance to get out of the rain and snow and warm up. 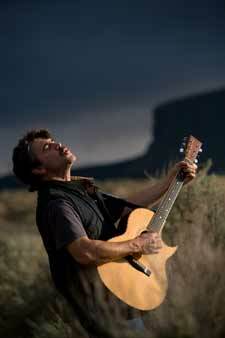 Aside from the Skagit River Interpretive Center and Marblemount Fish Hatchery, which are always open weekends throughout the winter, there are some unique activities available January 14 and 15 2012 only. Saturday only in Concrete, the Concrete Heritage Museum is open from 12-4, songwriter Dana Lyons is performing at Concrete Theater at 2:00 ($10), and Ovenells Heritage Inn is offering a hayride and bonfire at 3:30, with chili, coffee and cocoa. Saturday and Sunday, head to the Marblemount Community Club between 9 and 4 for native American drumming and dancing plus crafts from Upper Skagit artisans. Artwork, breakfast (biscuits and gravy, pancakes, sausage) and lunch (Indian tacos and fry bread!) will be available for purchase. Special performances will be at 2pm each day. Saturday from 2-3, historian and legend storyteller Rosy Cayou of the Samish Indian Nation and Indian drummer Tsul-Ton from the Upper Skagit tribe/Samish Indian Nation will be sharing history and legends of the northwest ecosystem through stories and song. 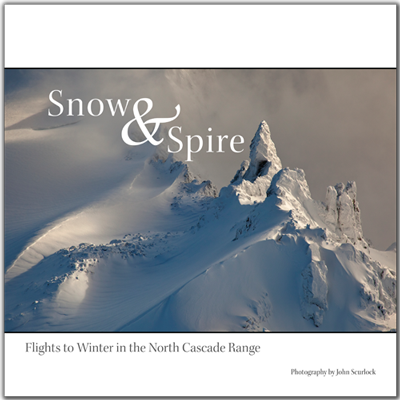 Also on Sunday, local pilot John Scurlock will present a slide show of aerial photos of the Cascade Range. Nice day. Where are the eagles? 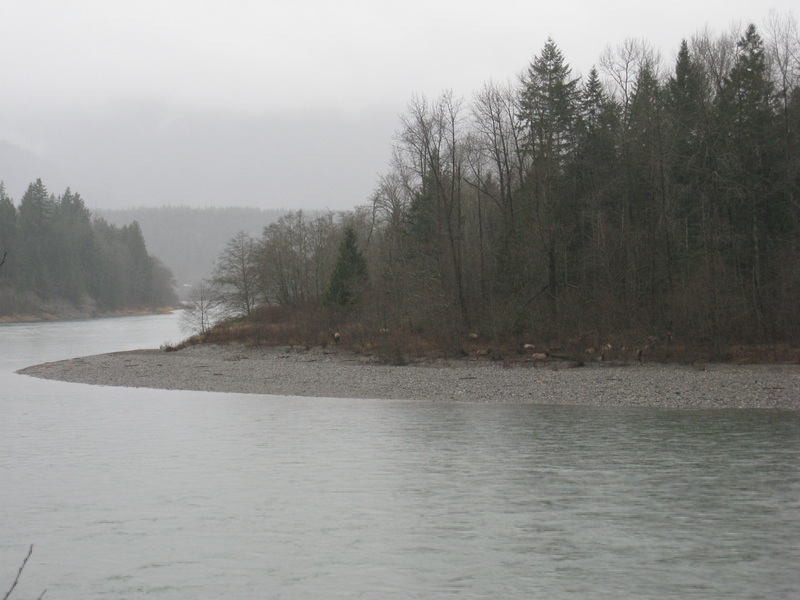 Word is they are on the Nooksack. Wet! 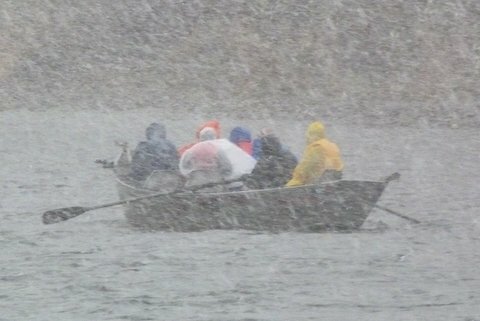 Rain certainly interfered with our visibility at times. A reward for venturing out yesterday: spotting 15 elk by the beach near Cape Horn.